With the stage rigged up with two overhead microphones, and three on the interview table, Wilfred is “warming up” the audience. For almost an hour previously, Harry Hudson had gone into his warm up routine and we had rehearsed the singing of the opening chorus. I never found out why there was a record player on the stage. Perhaps it was there to replace Harry if he had a bad turn! In the front row, from the left, are Mabel “at the table”, Lily Jakes, Ethel Jeffrey, Rev. Edward Bradbrooke, Mrs Agnes Dengate, behind Wilfred are Bill Funnell and Horace Mills, with Harry Hudson “at the piano”. 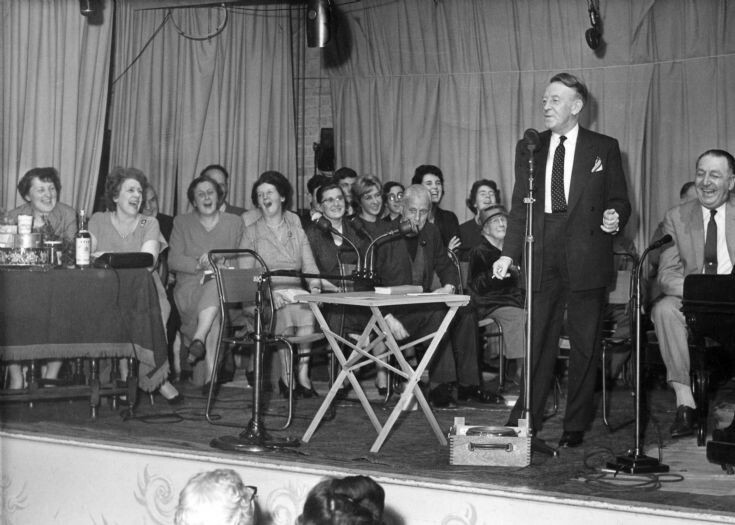 At the back were other members of the Slaugham church choir, including Maurice Abbott (behind Mrs Jakes) and Penny Housby, second from the right. When the 200-odd members of public arrived at the Parish Hall, the sight of a large BBC Outside Broadcasting Unit parked right outside the front door reminded everyone that this was a special day for Handcross. With just one minute to go, we had to sit there in absolute silence as the seconds ticked away. I recall that Wilfred’s face went redder and redder as it approached the time. Suddenly a red light lit up above the stage, and with Harry pounding the piano “Dumdiddy, dumdiddy, dum”, we all burst into song with “Have a go, Joe……….” Handcross was on the air to the nation. Click on Open Document for a newspaper review of the show. Use the controls below to hear a recording of the show. It was a bit of a shock to recognise myself next but two to my grandmother Mrs.Lily Jakes.